Yesterday I was reading Whitson's post about Facebook update on "Nearby Friends" and able to find it interesting so, I was experimenting with facebook app & trying to figure it out, exactly how it works ( opt in & enable "Nearby Friends" notification in app setting, turn on location in phone & app, re-install Facebook app too) but me and my friend, nether able to get any notifications for "Nearby Friends". I guess not rolled out in our accounts yet. During that time, I was able to find out a very good thing for Facebook Fanatics (I'm one of them :) ). 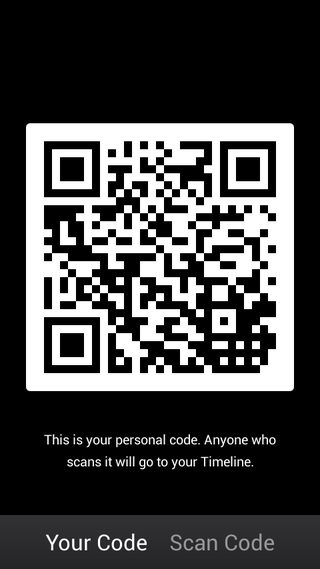 I'm able to find QR code in the app which enables you to redirect to the timeline and then easy to add friends into your facebook account. Facebook provide built-in QR code and a Reader to add friends quickly. You can flash your QR code to your friends, then your friends can scan the code & add you in their account and vise verse. QR code contains the link "http://facebook.com/qr?id=your facebook id number" which is very useful to track how many of your facebook contacts added via QR code. QR code already available for Facebook Pages but now also available to Facebook Profiles but limited to Mobile Apps. Not yet available to facebook website & mobile site. Of course you can use any third party QR code reader to read this code or create a custom QR code for your facebook profile but in both case it will redirect you to your facebook url only. Using Facebook built-in code & reader provide you advantage to redirect you to the profile timeline & then able to "add as a friend" directly via App interface (i find it fast, smooth & easy). You can also copy the QR code image and use it in your visiting cards & websites if you want.